Mochi are Japanese sweets, that are made from glutinous rice. And even though it sounds like “gluten”, there is no gluten in glutinous rice, so mochi are naturally gluten-free and also vegan! 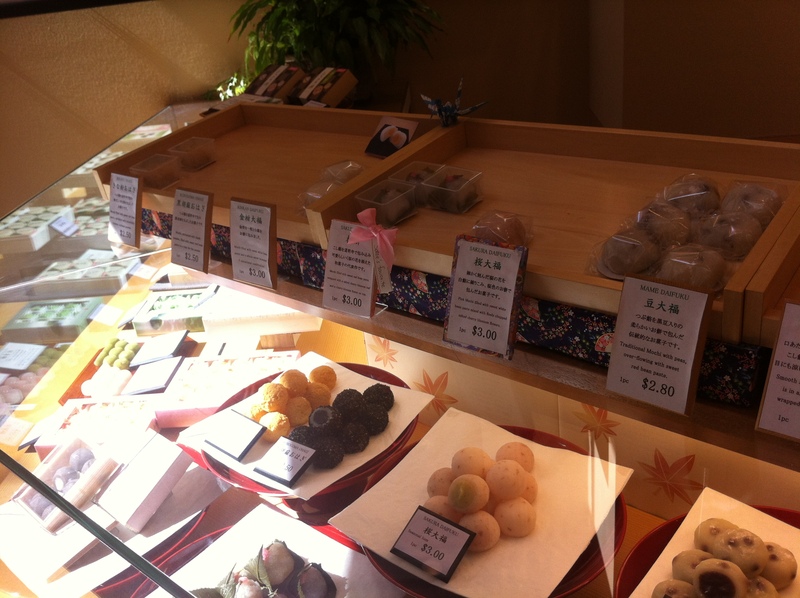 There was such an amazing selection of mochi and other Japanese sweets, that I didn’t know where to start. And then I saw it. A cherry blossom flavoured mochi, marked as “Satoe’s favorite”. 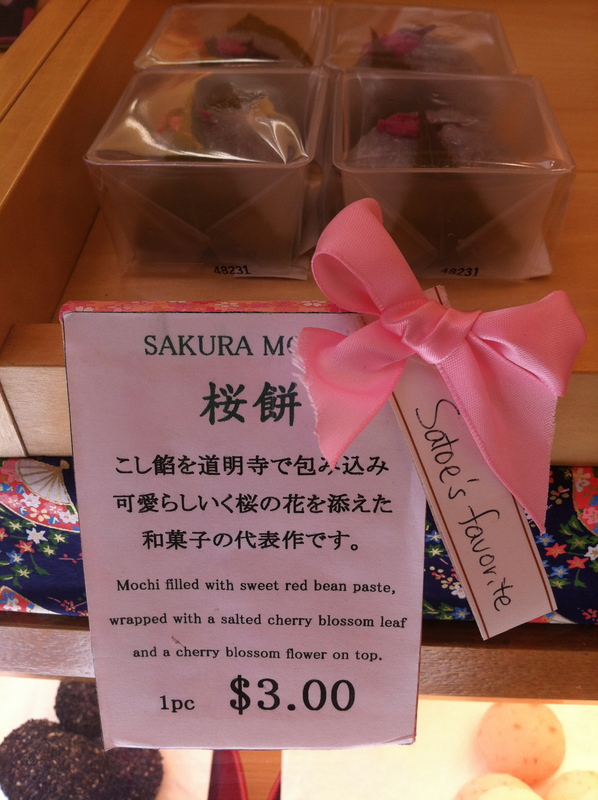 Now I don’t know who Satoe is, but I thought it would be worth trying… especially as the cherry blossom leaf that wrapped the mochi was salted. I love salty/sweet things. And ohhhhh, it was heavenly. The rice itself was chewy — kind of like the sticky rice you get at Thai and Laotian restaurants. 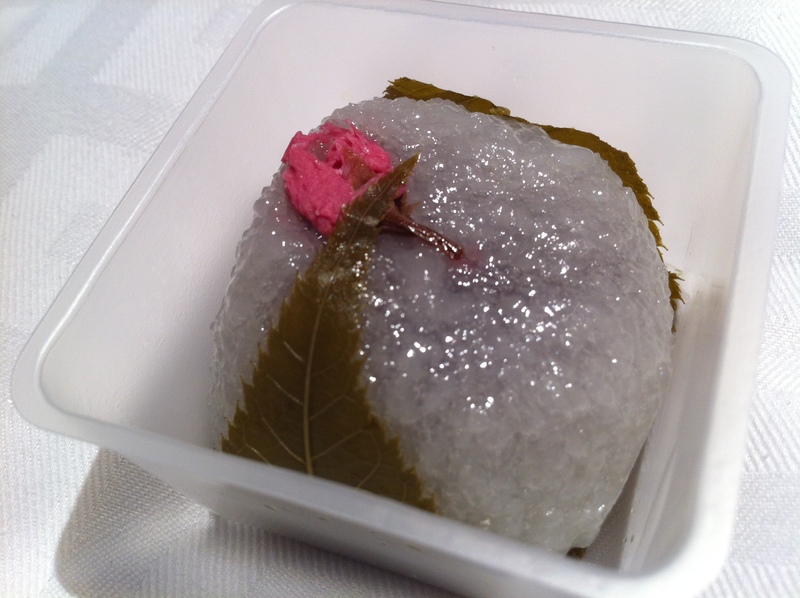 Inside the ball of rice, was a centre of red bean paste — it was quite sweet, and so the salted cherry blossom leaf offset the sweetness perfectly with the salt. Kind of like the Japanese umeboshi plum sweet and sour candies. But much more decadent! I also had to get one of their “most popular items” in case the cherry blossom flavour combo was too much for me to enjoy as a mochi newbie (luckily, this wasn’t my problem). 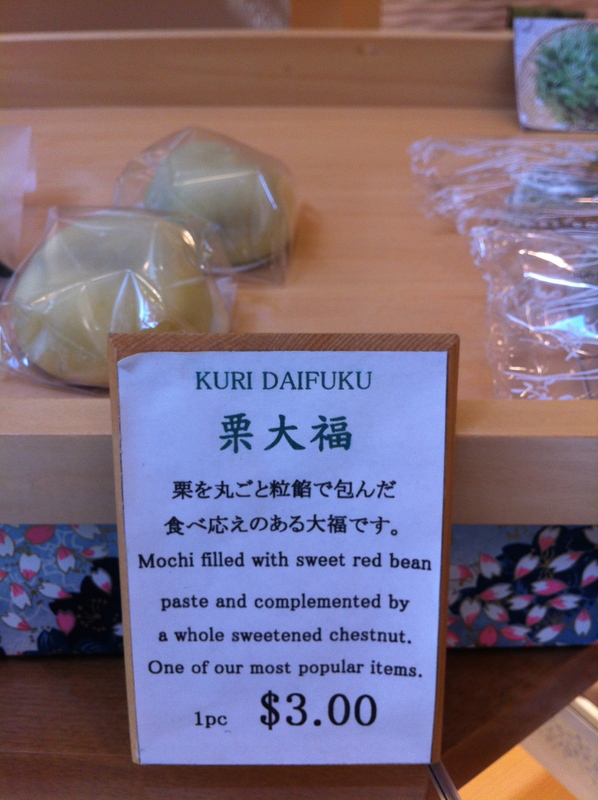 So I chose a “safe” bet — the Kuru Daifuku: mochi with red bean paste and a chestnut. I love chestnuts in any form, and this did not disappoint. Mmmm. Ok, now I’m totally hooked on mochi, and I’d love to find some locally. Or maybe I have to make my own? 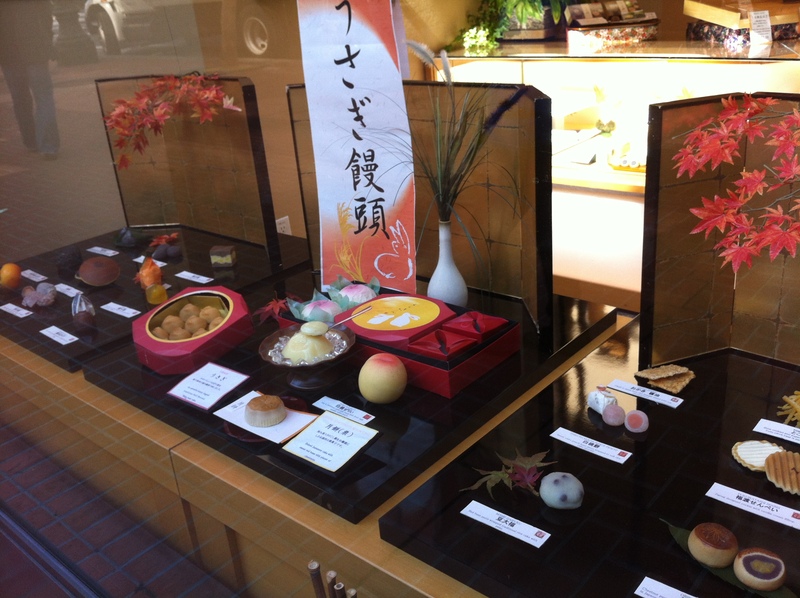 In the meantime, I’ll be looking at the gorgeous treats on the Minamoto Kitchoan website and dreaming of San Francisco. Mmmm! I love Mochi! It is hard to find it both vegan and GF here. I found some online, but it wasn’t that good. The pictures that you took look amazing! Thanks for the recomendation! I’m writing this from SFO on my way back to Toronto and found that one trip for mochi wasn’t enough! You’re so welcome!!! I wish it had a longer shelf life so I could have brought a stockpile home!! !